Jeremy Corbyn has accused the government of "flip flopping and floundering" over public sector pay. 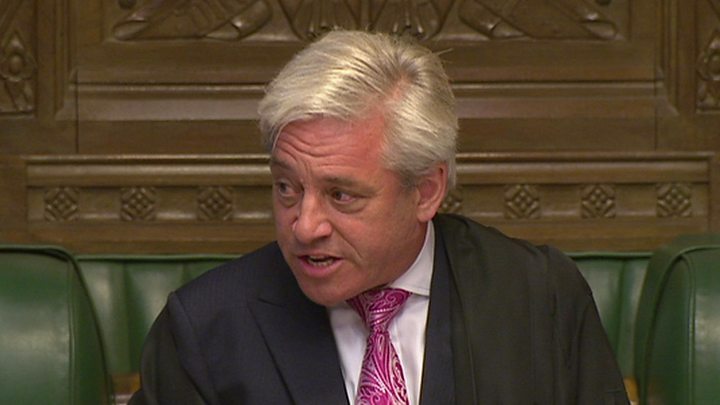 During PMQs, the Labour leader said that through the 1% pay cap the government was "recklessly exploiting the goodwill of public servants" and called for it to be scrapped. Theresa May said the government would study pay review recommendations "very carefully" when they are made. And she said Labour would "bankrupt our country" if Mr Corbyn became PM. Kuenssberg: Will cap be lifted? Several ministers have suggested they want the public sector pay cap, introduced in 2013 following a two-year pay freeze, to be lifted, and some Conservative MPs have called for a change of direction after the Tories lost their majority in the general election. 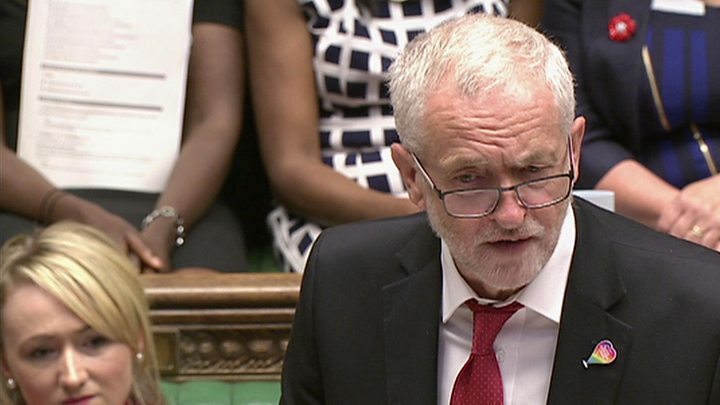 Mr Corbyn focused on the subject during Prime Minister's Questions in the Commons, saying there was a "low pay epidemic" in the UK, and that pay levels were causing a "real shortage" of NHS staff. 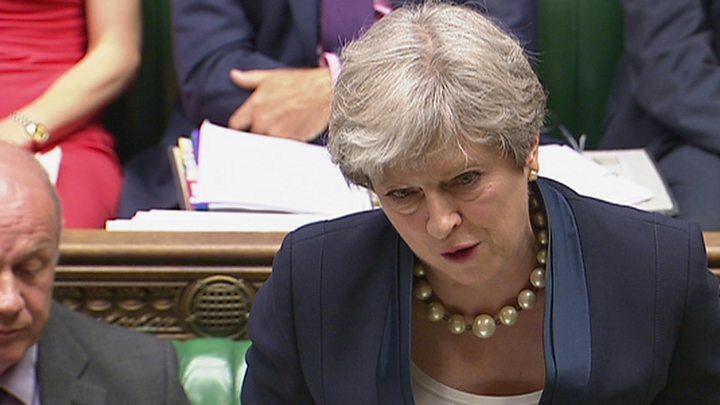 In a reference to the Conservatives' deal with the Democratic Unionists, he said: "The prime minister found £1bn to keep her own job - why can't she find the same amount of money to keep nurses and teachers in their own job - who after all serve all of us." Mrs May said she valued public sector workers' "incredibly important work", adding: "I understand why people feel strongly about the issue of their pay." 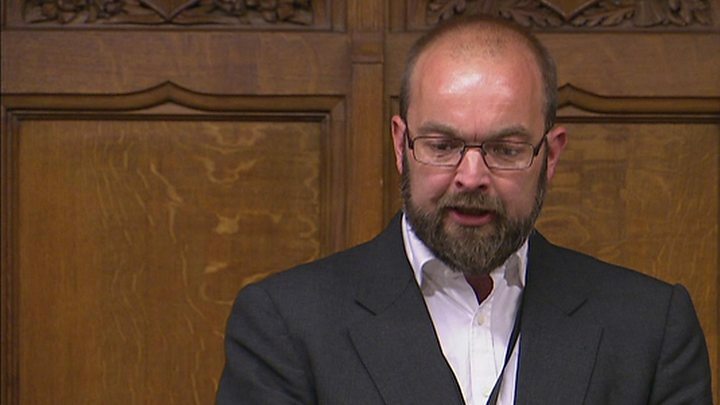 Media captionJames Duddridge is the first MP to take advantage of relaxed dress rules and speak at PMQs without a tie. The government would balance future decisions with "the need to live within our means" she said, adding that the policy had to be "fair to those who pay for it". She also mounted a fierce defence of the Conservatives' record in cutting the deficit and increasing wages and employment. And she referred to Mr Corbyn's description of Labour as a "government in waiting". "We all know what that means," she said. "Waiting to put up taxes, waiting to destroy jobs, waiting to bankrupt our country. We will never let it happen." Labour continued the pressure on the pay cap after PMQs, tabling an urgent question in the Commons. Shadow chancellor John McDonnell compared cabinet ministers to children "scrapping in the school playground" over what should happen to the policy. Chief Secretary to the Treasury Liz Truss said the cap remained in place "because it is the responsible thing to do". Earlier one union described the 1% cap as "dead in the water" after receiving an offer of a 2% increase for its workers. Nonetheless, the Fire Brigades Union (FBU) said the offer was "simply not good enough". "It does not recognise the extra work firefighters have been doing, it fails to address their falling living standards and, despite hints at improvements, does not make clear what they will be earning in future years," said FBU general secretary Matt Wrack. Speaking on BBC Radio 4's Today programme, Transport Secretary Chris Grayling rejected the suggestion the offer to firefighters had "busted" the 1% cap, saying they were the responsibility of local authorities rather than central government. The wages of public servants the government is responsible for "will be a matter that's addressed in future Budgets", he said. Image caption The Fire Brigades' Union has criticised the 2% offer but says it shows the cap is "dead in the water"
Most public sector workers' wages are set by ministers after receiving recommendations by independent pay review bodies, which are delivered at different points in the year. Teachers and police are expecting a government response to their pay bodies' recommendations later this month. Downing Street has insisted the policy has not changed, with Chancellor Philip Hammond urging ministers to "hold their nerve". Asked about the debate within government, Mr Grayling said: "There is always going to be a debate around the cabinet table about what to do - and we are not all clones - but the bottom line is that we are a team." Speaking on BBC Radio 5 live, former Conservative Party chairman Lord Patten called on Theresa May to tell "others who've got their own opinion to shut up". "There is a sense you have at the moment of everybody doing their own thing," he said. "Nobody actually asserting very clearly what they want to do in the national interest. "We can't go on living from hand-to-mouth in this sort of shambolic way." Meanwhile the FDA union, which represents senior civil servants, has written to Foreign Secretary Boris Johnson along with other cabinet ministers who have indicated they support easing pay restraint, calling on them to follow up their "warm words" with action. "Each of these ministers will have sign off on the pay settlement for their staff this year. They cannot hide behind pay review bodies with restricted remits. Failure to act will demonstrate these warm words were little more than meaningless platitudes," said general secretary Dave Penman. The Institute for Fiscal Studies has said increasing pay in line with inflation next year - rather than 1% - could cost about £5bn. Speaking at a conference in South Korea on Tuesday, former prime minister David Cameron said people calling for an end to austerity were "selfish". "The opponents of so-called austerity couch their arguments in a way that make them sound generous and compassionate," he said. "They seek to paint the supporters of sound finances as selfish, or uncaring. The exact reverse is true. "Giving up on sound finances isn't being generous, it's being selfish: spending money today that you may need tomorrow." Pay review bodies are able to recommend higher increases despite this policy, although the former chairman of several bodies, Alasdair Smith, told the BBC to do so would be a "big step"